About 120 residents, elected officials, representatives of local businesses and community organizations attended the April 13 ribbon-cutting ceremony, officially “opening” the new Village Hall and celebrating the Village’s 1st year anniversary. In addition, the Naples Daily News, News-Press, NBC-2, and Estero Lifestyle Magazine were present to document this historic event. Following the pledge of allegiance and invocation by Rev. Kevin Morris, Hope United Church, all Councilmembers cut the ribbon, officially initiating the new Council Chambers. Mayor Nick Batos welcomed the crowd to the new hall. He noted Council was also celebrating the anniversary of the very first Council meeting held on March 17, 2015. 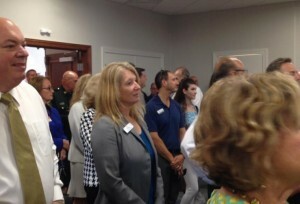 He thanked Florida SouthWestern State College for donating the distinctive dais and the Estero Chamber of Commerce for donating the American and state of Florida flags. Lee County Commissioners John Manning, Cecil Pendergrass, Larry Kiker, and Brian Hamman then joined the Councilmembers behind the dais, where Commissioner Kiker spoke for the group congratulating the Village on their new “home” and its work to date. Don Eslick, Interim Chairman of the ECCL. Village Manager Steve Sarkozy then came to the dais and introduced the Village Staff: Village Attorney Burt Saunders, Community Development Director Mary Gibbs, Village Clerk Kathy Hall, Finance Director Lisa Pace, Communications Specialist Marilyn Edwards and Administrative Assistant to the Village Manager Tobi Tirado. The Mayor then introduced the Councilmembers who each made their own welcoming remarks. Councilmember Bill Ribble then introduced College of Life Foundation Chairman Charles Dauray, who presented the Village with three pieces of artwork, which are on permanent loan. The Mayor closed the ceremonies by inviting everyone to take a tour of the newly renovated facility.